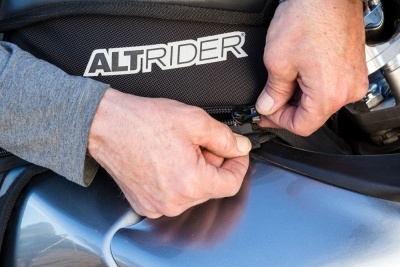 The new tank bag in the AltRider Hemisphere soft luggage line is smartly designed to make your tank bag configurable to you with a waterproof seal to protect your expensive items. Each essential item such as your cell phone, map, camera, and ear plugs are compartmentalized for easy access. 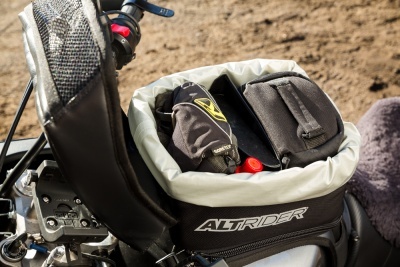 The AltRider tank bag was created to fit the curved fuel tanks of a large range of bikes from the BMW R 1200 GSW down to the nimble KTM 500 EXC. 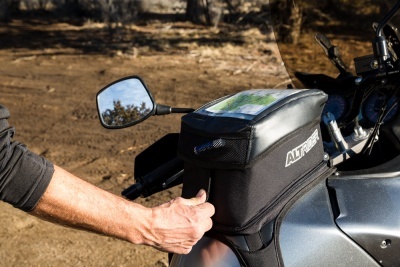 We've laid out the steps for you to install the tank bag properly and a few tips in between on how to pack your personal items. 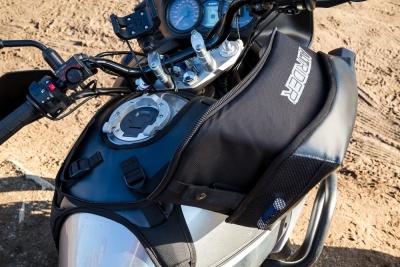 The Hemisphere Tank Bag will last you through many years of adventures with proper care and installation as it’s constructed with 1050 denier ballistic fabric and 18 oz vinyl coated polyester. 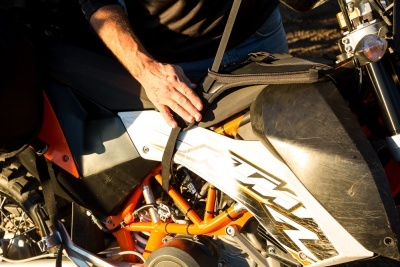 Before attaching any straps, position the tank bag on your fuel tank and make sure you can rotate the handlebars ‘lock to lock’ without the bag touching your controls. Make a mental note of the position, then unzip the bag from the harness and begin the strapping process. Straps are full strength ballistic webbing and all stitching uses military grade thread. Thread the forward strap around the headset or steering column part of the bikes frame. The 2 rear side straps thread down to the main frame tubes and back up to the harness. Thread through the padded strap slots under the burly zipper and tighten with the ladder lock buckles. Some riders will attach the harness with the seat off the bike and then re-install the seat. The hard part is over! Zip on the tank bag but be nice to it -- if it becomes clogged with mud or anything sticky, rather than forcing it shut, clean it with a mild soapy solution or lubricate it with a wax based product like this. Traditional fuel tank access was taken into account in the original design so both the shape of the main tank bag and the harness were designed for usability. 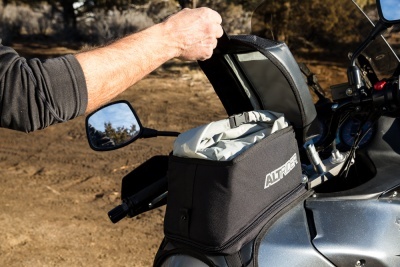 Unzip the bag ¾ to fuel up or take it off completely to carry around your pit stops for safety. One snap of the burly metal 5/8” snap (easily done with gloves) and you’re ready to pack your bag. Stowing gear is up to the user but since the interior dividers can be arranged in myriad configurations as well as being completely removed, the options for creating custom spaces inside the main compartment are nearly endless. The vertical walls of the bag are built with plastic stiffeners and wrapped with closed-cell foam padding that is covered with ballistic nylon. Your DSLR can easily fit into this bag if you like to snap impromptu pictures along with a few other personal items. Tough marine-grade vinyl will hold up to UV exposure and is easy to see through with no distortion. The zipper is located under the map pocket on the inside of the lid, exposing less moisture to the inside of the window pocket for maximum defense from the elements. The touch screen features on most smartphones will still work over the thick vinyl. Use the side webbed pocket for small items like chapstick or ear plugs. 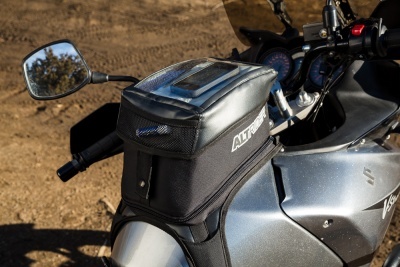 If you see rain clouds ahead, the AltRider roll-top dry bag system is enough to keep the water out. The main compartment liner is constructed with a 10 oz ripstop pack cloth and all seams are taped for waterproofing. It’s only waterproof with the right technique of closing it -- make 3 rolls of the generously tailored liner and snap the side release buckle to keep it sealed. If you know its all sunny skies ahead, travel with the main compartment in the “cuff mode”. The dry bag will roll down like cuffs on a pair of pants for quicker access to your belongings. 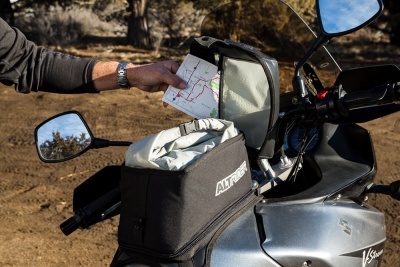 Click here to order your AltRider Hemisphere Tank Bag. 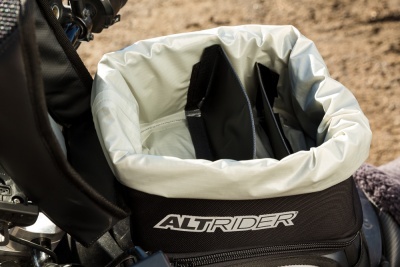 Also in the AltRider Hemisphere soft luggage line are soft panniers, and saddlebags.